Converting a part of the Roerich family estate in Bangalore into a garbage dump is sacrilegious and an insult to the memory of a couple who spent a lifetime bringing the people of Russia and India together. Like many other staunch supporters of Indo-Russian friendship, I was shocked when I read that a small-time politician from the city of Bangalore suggested that a part of Svetoslav Roerich and Devika Rani’s estate be converted into a garbage dump. Bangalore, the once serene and quite town in southern India, is a living example of a paradise lost. Formerly called the ‘garden city,’ India’s information technology hub has lost more than 60 percent of its tree cover. The clean air and traffic-free roads of the city are a long-gone memory. Yet Karnataka’s capital possesses an undeniable charm and is very cosmopolitan and progressive. A decade and a half of mismanagement has destroyed many parts of the city and led to some serious civic issues. The city faces a major garbage crisis and the stench of thousands of tonnes of uncleared garbage has been described as unbearable even for a person who once lived in Bombay and crossed the Mahim Creek every day on his way to work. Bangalore remains a special city when it comes to the friendship between India and Russia. The city had a Minsk Square (yes, I know that Minsk is in Belarus), which gave way for the construction of an underground metro line. The information technology capital is close to a sister city agreement with Samara. Of course, the relations between Bangalore and Russia go deeper than political arrangements. Many employees of Hindustan Aeronautics Limited (HAL) have been to Russia and worked with Russian engineers on joint defence projects. HAL is playing a major role in the development of Sukhoi Fifth Generation Fighter aircrafts. Brainpower is the key word when it comes to the exchanges between Bangalore and Russia. The southern Indian city also has a small Russian community that finds the city with a nice climate as the best place to live in India. 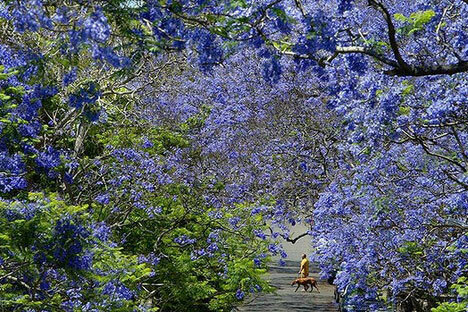 I remember grumbling once about an unusually hot day in February in the city, when a Russian friend asked me to simply observe the beautiful riot of colours caused by the flowering of the Jacaranda and other trees. It was this Russian eye for beauty that made Svetoslav Roerich choose the location to set up his estate. The sprawling Tataguni Estate, which was owned by Roerich and his wife Devika Rani, remains one of the few places in Bangalore that are a reminder of the bygone Garden City era. After close to two decades of litigation over the property, it went into the hands of the Karnataka government. It is up to this very government to protect one of the last remaining green areas of Bangalore. Plans were on to turn the 468-acre estate into a cultural hub with a museum and a rose garden. Since the Roerich family believed in living in harmony with nature, the Karnataka government as the custodian of the property needs to maintain the serenity and sanctity of the estate. The public mood in Bangalore is in favour of preserving the estate and blocking the nefarious designs of the deputy mayor to move the garbage dump there. The Times of India called the garbage dump proposal “preposterous.” In an editorial, the paper came down hard on the man suggesting the idea and said, “The estate, the abode of the world-renowned couple, cannot be trifled with in this manner, even if it has been taken over by the Karnataka government,” the Times said, calling for the state to find another alternative. Thankfully there are also voices of reason within the government of Karnataka. The deputy chief minister of the state, R. Ashoka said the estate would not be used for dumping garbage. “We have ample space available elsewhere. Roerich made Bangalore famous with his art. We will not disturb the estate for anything else. I wouldn't like to comment on the person who suggested this,” Ashoka was quoted by various India media outlets as saying. The Tataguni Estate, if maintained properly, can play a greater role in bringing the people of Russia and India together. India has the kind of soft power that most countries can only dream of and given how the world continues to become more inter-connected, preservation of the country’s international heritage will go a long way in furthering goodwill for India.